US-Germany Rift Set To Blow: “How Long Can Berlin Tolerate This Abusive Taskmaster? But above all his complaints, Trump has continually rebuked Germany for not spending enough on NATO commitments, sniping that the country is freeloading on American military protection. 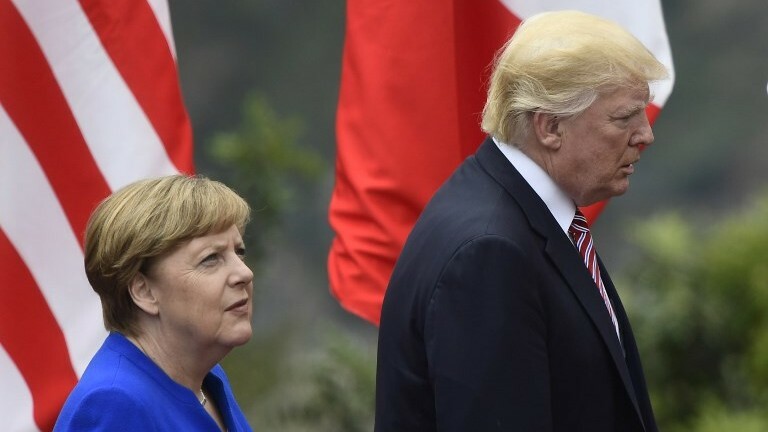 At a NATO summit last year, Trump hectored German Chancellor Angela Merkel to raise her country’s annual military budget to the designated NATO target of 2 per cent of Gross Domestic Product (GDP). His condemnations this week regarding Germany’s military budget have again sparked furore among the country’s politicians and media, eliciting further public calls for the envoy to be expelled owing to his alleged gross interference in Berlin’s internal affairs. “An ambassador is not supposed to act like the spokesman of an occupying power,” said Wolfgang Kubicki, the deputy leader of the Free Democrat Party. The New York Times this week reported “the timing couldn’t be worse” for US-German relations. Next month marks the 70th anniversary of the founding of the NATO alliance. A major celebration is due to take place in Washington DC for the occasion. The atmosphere will be severely chilled by Germany’s truculent defiance of Trump to boost its commitment to NATO. Out of some 30 members in the US-led NATO bloc, only seven countries have managed to raise their military budgets to the 2 per cent of GDP target that Trump has clamoured for. That target figure predates Trump’s presidency. But since the end of the Cold War, many European members of NATO have reduced military spending. Trump has made it an obsessive issue and has even threatened to pull the US out of NATO if European members don’t pull their financial weight. Germany and others should call Trump’s bluff and say, “go ahead!” — pull your troops, missiles and warplanes out of Europe. US forces in Europe have never been about “protection” and have always been about “projection” of American hegemonic power over European vassals, in particular, to prevent a normal and natural relationship with Russia progressing. The American obsession with military spending needs to be vigorously challenged. What is this pathological addiction for? It is of course about milking the civilian economy to fatten the profits of giant military companies. It’s a racket that requires the poisoning of international relations with Russia and China, among others, in order to sustain the charade of syphoning off public money. The greatest security threat to Western societies is the massive growth of poverty, deprivation and inequality, according to a new OECD report. The whole scaremongering about Russia and other “foreign enemies” is a risible ruse for the obscene misuse of public money by a military-industrial complex that is a colossal parasite on society. A laughable contradiction is that Trump is supposed to be a “Russian puppet”, according to his domestic political enemies, and yet he is pushing the anti-Russia pretext on behalf of the military-industrial complex more than any president. One senses a showdown looming between Washington and Berlin. Germany has for too long been allowing itself to be kicked around by an American “occupying power”. Under Trump, the insulting humiliation has only become more acute. How long can Berlin tolerate this abusive taskmaster? Especially when there is growing opposition in the German and wider European public despising the American overlord and its dictates.